Colorado. Named after the Colorado river that runs through the state, named by the Spanish after the red silt that is carried along the river. Colorado is one of three states within the US that have no natural borders. It is, effectively, a rectangle shape. Apart from coastline, Colorado boasts all types of terrain. Deserts, plains, mountains, and canyons. The territory that is now Colorado had been settled by Indians for thousands of years. However, the first Europeans where the Spanish, who explored the area in 1598, but it was not until 1706 that the Spanish formally laid claim to the territory. Then, finally, in 1787 the Spanish tried their first settlement, but it quickly failed. The Spanish never really pushed to settle in Colorado, but did visit, to hunt, and to trade with the native Indian tribes. 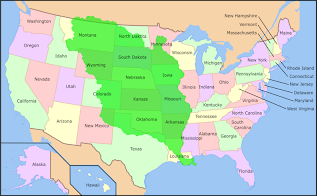 Later, in 1803, the United States gained a claim to the eastern half of the current state of Colorado through the Louisiana Purchase. 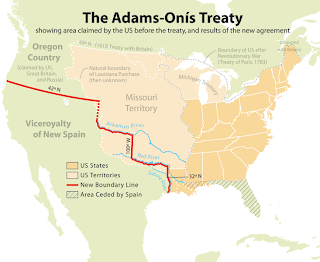 The US finally sent an expedition into the territory to explore in 1806, only to see it arrested by the Spanish, and expelled from the region, given that the Spanish still laid claim to large areas, disputing the sale. 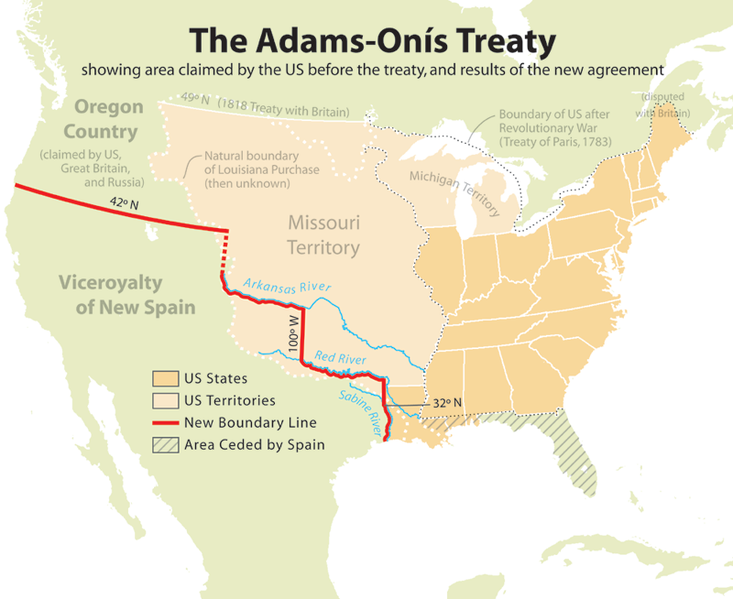 In 1819, The US ceded its claims to the western half of Colorado by the Adams-Onis Treaty. This was signed with Spain to solidify its borders. Some areas on the US' western border area where handed back to Spain. In return, The US gained Florida from Spain, as well as taking over Spains claims to Oregon. The US finally gained control of all the territory that now makes up Colorado after the Mexican-American War, which ended in 1848. The treaty forced Mexico to cede all its northern territories. For the next 2 years, the territory was unorganised, finally, in 1850, the US senate created 2 new territories. The territories of New Mexico, and Utah. 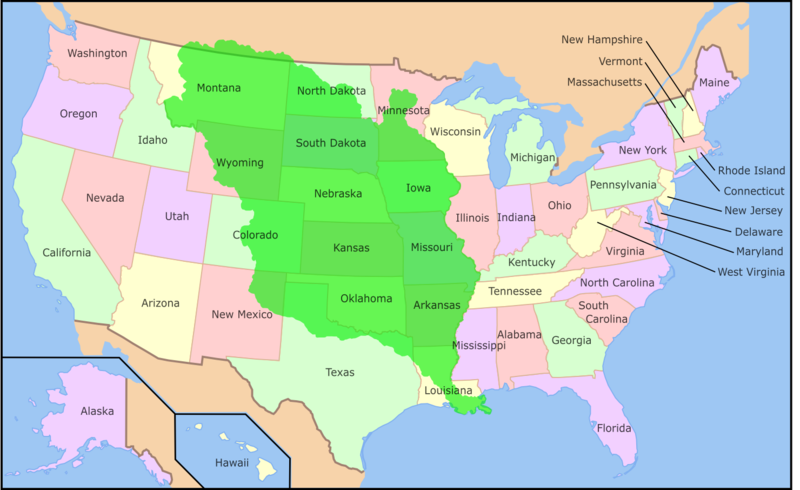 Then, the rest of the territory was organised in 1854, with the creation of the Nebraska and Kansas territories. These 4 territories all met in what is now Colorado. The Pikes Peak Gold Rush began in 1858, and saw well over 100,000 people moved to the area. The gold rush only lasted for a few years as river gold was quickly panned, and the shallow seams of gold were soon mined out. The deeper seams proved tough to mine, and high in sulphide, making it hard to extract and purify. The gold rush petered out. However, the problem of the sulphide was soon fixed and led to gold mining becoming a major industry. 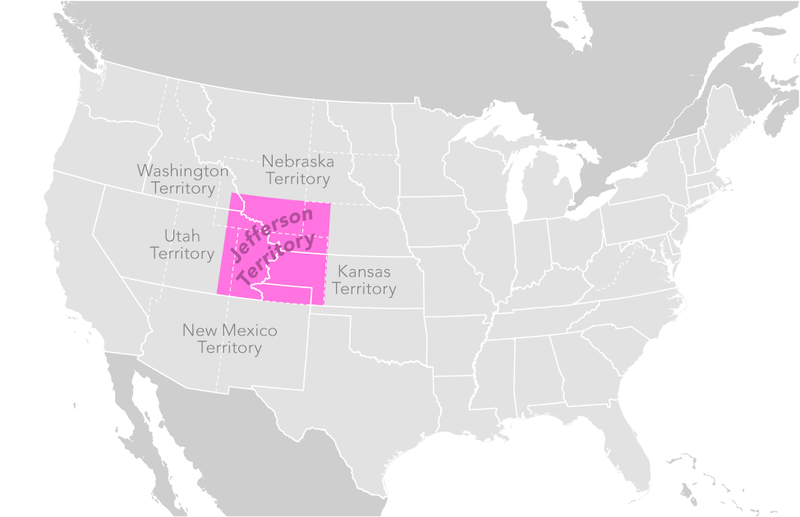 In 1859, the gold miners sought to try to set up their own territory, the Territory of Jefferson. This would have been the same shape, but larger than the current state of Colorado. However, it got nowhere. In 1861, the Territory of Kansas was shrunk, and admitted to the Union. The haste was driven by the secession of the southern states and the establishment of the Confederate States of America in 1860. 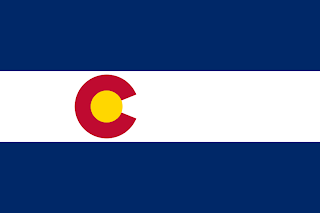 With the admittance of Kansas, it left the territory left as unorganised, so the US moved quickly to establish the free (non-slave) territory of Colorado. Just 30 days after the admittance of Kansas. This territory took the same borders that the state has today. 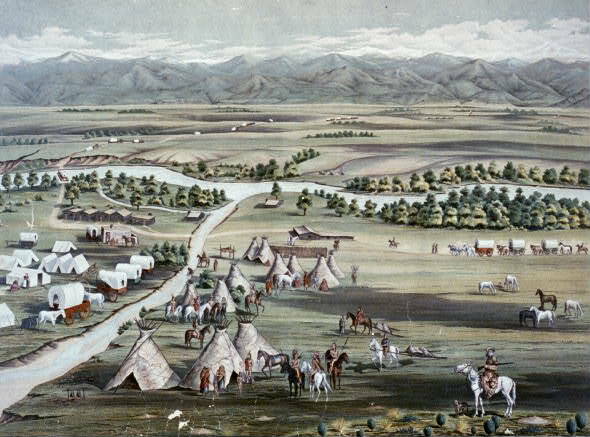 Colorado saw a drop in its population as gold became harder to get, and as a result as people headed back to their home states to fight in the Civil War. However, Colorado was not without a fight. Despite having strong leanings to support the south, Colorado stuck firmly with the Union. Indeed, seeking to disrupt mining, Texas sent a force north through New Mexico. Only to be stopped at the border. 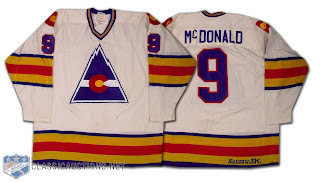 Colorado never was attacked again for the rest of the war. After the Civil War, a movement began to push for statehood. It got so far as the Admission Act in 1865 being passed by Congress, only for the President to veto it. For the next 11 years, one side or the other would support the act, only for movement to grind to a halt. Faced with a declining population, many businesses pooled their money to find an extension to the Transcontinental Railroad. This connected Denver, making access to one of America's highest cities a lot easier. Also, this was beautifully timed with the discovery of major silver deposits sparking a silver rush to the area, as well as a major gold find at Cripple Creek. 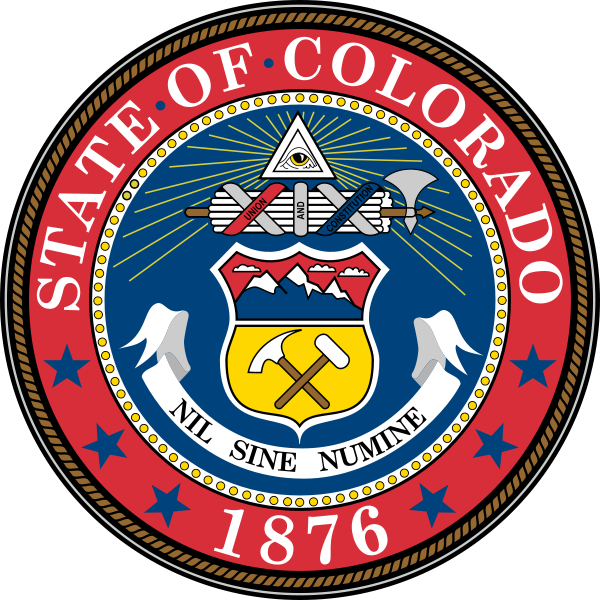 Finally, in 1875, the Admission Act was passed, enabling Colorado to be admitted to the Union as the 38th state on August 1, 1876. 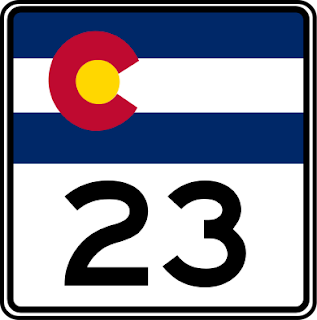 Just 28 days after the Centennial of the US, earning the state the moniker of "The Centennial State." 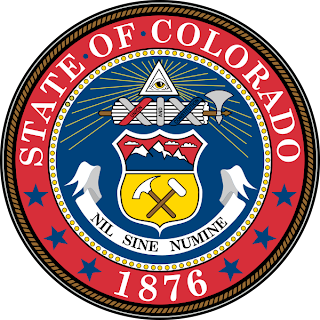 The seal of Colorado was adopted in 1861, upon the creation of the Territory of Colorado, and has remained unchanged ever since, apart from the amendment of the date from 1861 to 1876 and altering "Territory" to "State" as Colorado was admitted to the Union. 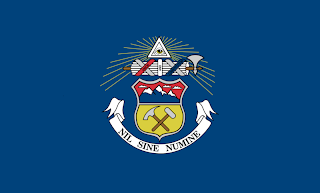 At the top of the seal is the Eye of providence, within a triangle, with rays spreading from both sides. Underneath is the Roman Fasces, laid horizontally. It is a bundle of birch rods and a battle axe bound together with a red, white, and blue ribbon. On the ribbon is inscribed Union and Constitution. The bundle of rods represents strength in unity, and the axe represents power and authority. Below the scroll is a heraldic shield. Across the top, on a red background, are 3 snow-capped mountains with clouds above, and below are 2 miners tools, the pick and and a sledge hammer, crossed. Both placed on a golden ground. Below is inscribed the motto, which in Latin translates roughly as "nothing without providence," or "nothing without the Deity." The first flag was not introduced until 1907, when the state took a plain blue flag and placed the seal in the centre, removing the red ring surrounding the centre motif. This flag lasted until 1911 when a competition was held to create a new, unique flag. Andrew Johnson created the new design, which was a flag with 3 horizontal stripes of blue, white, and blue. A gold disk was placed off-centre in the central white stripe towards the hoist. A red "C" was wrapped round the gold disk. The red C was placed within the white stripe. In 1964, the state introduced new rules, stating that the gold disk should be the same width as the central white stripe, thus making the red "C" overlap the top and bottom blue stripes. 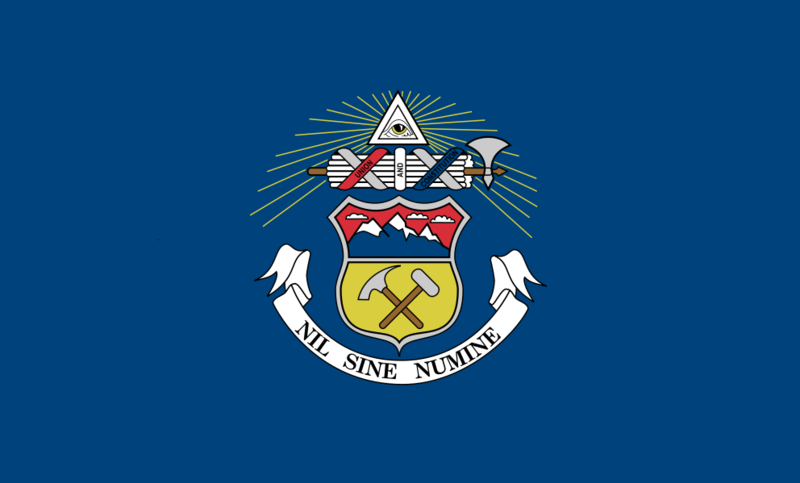 The blue is to represent the skies over the state. The white representing the snow-capped mountains. The yellow represents the sun that shines for extended periods over the state, and the red represents the red coloured earth in the state. The flag has proved popular, to the point that it has been incorporated into the states highway markers. 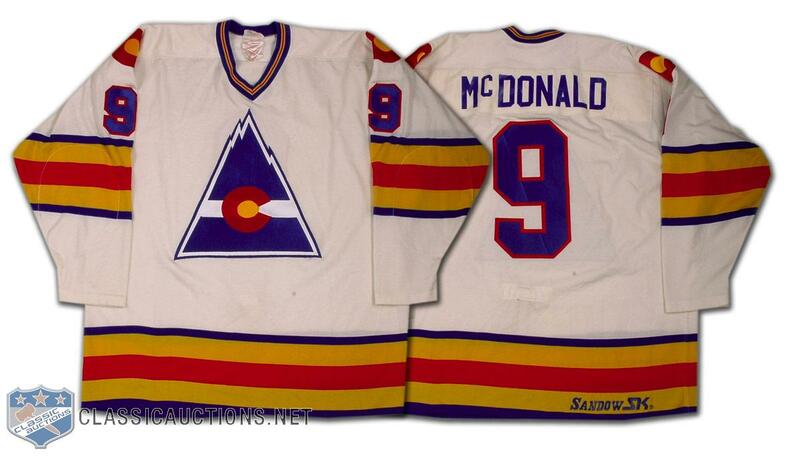 As well as being incorporated into the main logo for the (now defunct) Colorado Rockies NHL Hockey team!